This is a quick sketch I drew as part of an airbrushing demonstration I did for my Sci-Fi illustration class. 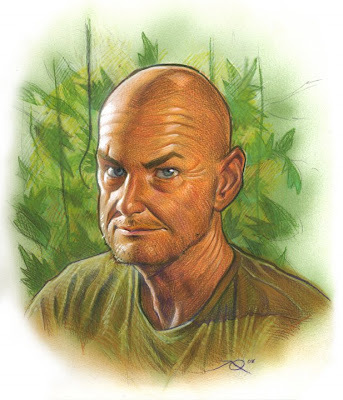 It's of the character John Locke from televisions über awesome tv series, LOST. Some said it couldn't be done. Some said It shouldn't be. Why draw an actor whom many of your students quite possibly would not even recognize? Why do an airbrushing demo at all? Does anyone even airbrush anymore? Does anyone know what an airbrush is? Nice! 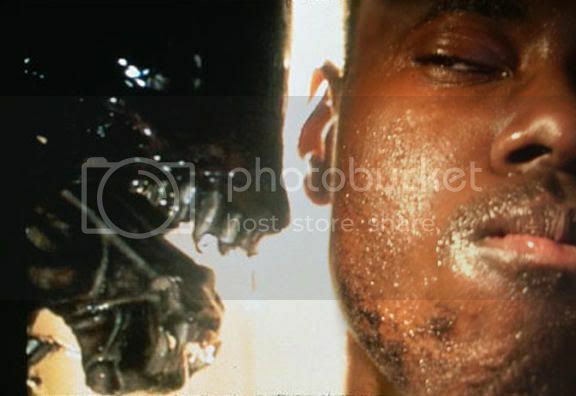 Although at this moment I h4t3 the Locke 'o' Johnz. i know what an airbrush is! amazing art results but i just hated to use it. too many delicate tiny parts which required constant cleaning and to use it you needed a steady hand which my itchy trigger finger could NEVER master! great art blog you got here! You mean the airbrush tool in Photoshop, right? Nice work! I haven't used a real airbrush since I painted you in a mini-skirt. Zing! I still have that airbrushed Raiders parody poster you made senior year, Joe! This is excellent. The jawline makes it. For some reason, I wish to see an 'pupilless eyes' version of this. Would be uber-creepy. Paolo why haven't you posted the painting of me in a mini-skirt on your blog yet?! Oh, and hi Chris.... I suppose I'd be open to doing commissions, but I'm more apt to do them at conventions. Next two up for me are in April - one in Boston, and another (Stumptown) in Portland, Or.